Just like every specialty in health care - physical therapists often get experienced at something specific. With experience comes increased knowledge in that particular area, added interest, confidence, and also - in many cases - improved outcomes. As an example, there are PTs that specialize in back pain with older people that have arthritis (for instance), and different PTs that specialize in back pain in young athletes with a stress fracture (for instance). You would expect each PT is excellent with the anatomy of the back and its complexity but one PT’s exercises and goals for their patient may be completely different than the others. Certainly each PT can switch their plan to fit the less than typical patient that comes to their clinic- but since it isn’t their usual mind-set it certainly will be more challenging and perhaps less efficient/experienced than had the patient chosen the PT more interested in the patient’s age and specific injury presented. “How Do I Know the Physical Therapist (PT) My Athlete is Seeing is The Right One”? Choosing the right doctor for your problem probably makes sense (you wouldn’t choose a sports doctor for your diabetes care for instance) - picking the “right physical therapist” is just as important for the recovery of your injured athlete! As another example - I’m a pediatrician who does 100% sports medicine- I wouldn’t be your best choice to get opinions about your diabetes… and I suspect the diabetes doctor/endocrinologist wouldn’t be the best choice for you to get recommendations about an ACL injury in your knee. Both of us might be good doctors - we stay up to date with current literature and changes in a specific category of medicine, and carefully examine patients with the same issues day after day- we likely are excellent in treating certain problems we are experienced seeing and thus the right doctor for that particular problem- but perhaps not as confident with every problem you need a recommendation (while still a good doctor perhaps not the right doctor for an issue outside our specialty). The “right physical therapist” for your athlete doesn’t mean a different physical therapist isn’t also good. Two physical therapists may be equally as good and as well trained – but because of their interest or knowledge in one field - one may be the right PT for one person’s needs - and a "less than right” choice for your athlete. Here is my opinion on what you as a parent (or coach) should consider when choosing the right PT for your athlete. There likely is more than one opinion - I welcome you considering those opinions as well! PT requires added time in your already hectic athlete’s schedule, money from your already packed budget, and hard work from your already hurting/sad athlete that would rather be in practice. Having said that, PT can be the difference maker in getting back to sport quickly and safely with less chance for re-injury. 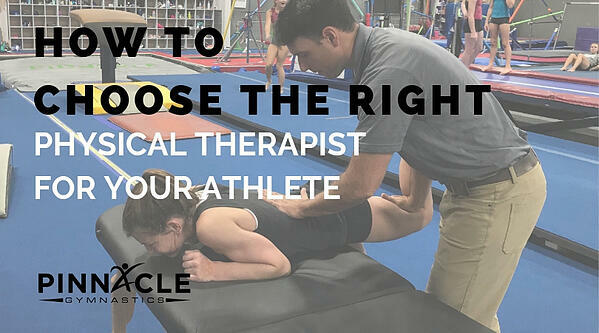 So picking the right PT will reinforce the doctor’s plan and estimated return to sport calendar, encourage an athlete to push (but know when to hold back if needed, based on previous experience), help plan with parents and coaches on what’s most likely for a return to competition (and travel) and make the most of every visit with the athlete’s goals in mind. An equally good but possibly "not right” PT for your athlete may also want to help but miss something stated above, causing an unintentional delay in return to sport or overlook something subtle and send back the athlete too quickly increasing the risk for re-injury. Most athletes have health insurance. This often is the first choice to be made unless the athlete’s family is willing to spend “out of pocket” money for a PT that is “out of network” but they still wish to use. Along with health insurance, most athletes needs a site that is convenient to get to considering school, practice, and the driver’s schedule. The perfect PT that is an hour away may just not be reasonable. Certainly the right PT that is ten or twenty minutes further than one not as knowledgeable about your PT needs would be worth the extra drive once or twice a week. Realize that an experienced PT (in your problem) may use more sports specific therapy, take less time figuring out the right program for your athlete, and communicate with coaches and doctors with more expertise than a PT that hasn’t seen that problem as frequently. So while convenience is important, if the athlete doesn’t get the “right PT”, does the convenience end up being worth it? In my opinion, here are the questions to ask the PT (who is reasonably convenient and accepts your insurance) to help ensure they are the right PT to help recover your athlete back to full sport. Let’s assume your athlete is a gymnast with a shoulder injury - (fill in your sport and specific injury). How often does the PT clinic see gymnasts? Every sport has different terms, different expectations before competition, and different nuances. Even if the PT is excellent with shoulder injuries, but is used to taking care of mostly throwing athletes, like baseball for instance, the PT may not be right for your gymnast. If the PT doesn’t know what a level 6 is versus a level 10, he may base your return to practice on what he knows from watching the Olympics on TV once every four years. The strength, flexibility, and impact/force required for the shoulder in a level 6 athlete on bars is completely different than that required for a level 10! This is also a good time to make sure the therapist working with the athlete is friendly – and has a good rapport with young athletes, as well as understands an athlete’s competitive schedule and the thought process of a high level competitive athlete, which is a different mindset perhaps than a patient whose goals are returning to a recreational activity. A frustrated athlete (and coach) can complicate the recovery and progress of the already unfortunate unplanned injury. Understanding the sport, the level, and the goal for the season is key to not moving too quickly and risk re-injury, or too slowly and not get back as soon as you safely can. What are the athlete’s short term and long term goals? A PT (and a sports doctor in my opinion) should ask these questions the first time meeting an athlete. 1. What is your sport? 2. What is your level? If the athlete is a first year level 5 gymnast and state championships is in six weeks - and the injury is a shoulder injury - that athlete is likely to have a completely different treatment strategy than an athlete with the same shoulder injury who is an elite level gymnast on the National Team with National Championships in two weeks. If the PT (or doctor) doesn’t understand the goals, from the athlete, coach, or parent, then it is difficult to know if the treatment timeline is possible and realistic to reach those goals. It is also challenging to know if the PT is pushing the athlete too hard for the athlete’s goals… or not pushing hard enough (with appropriate protocols and safety considered in each case). Some diagnoses follow a protocol with a set time line, such as post-operative protocols from the surgeon for instance - but many (perhaps most) vary depending on the success met in the PT clinic, the athlete’s healing and recovery, which are variable, and the athlete’s goals, often determined long before the injury even occurred. #3 Is the Physical Therapist doing exercises/therapy that is FUNCTIONAL? Think of “functional” as “sport specific”. Functional for a gymnast might be a handstand position or punching off a springboard and for a football player function may be a three point stance or a sprint in a diagonal pattern while catching a ball. A soccer player’s function must include foot skills dribbling a soccer ball, while a volleyball player must have spiking and setting a volleyball in their list of functional requirements. The PT must ask what sport the athlete is in to be thinking about function! Take for instance, the gymnast with a shoulder injury - to get back to competition they will need to tumble (impact/pounding on their upper extremity) as well as do bars (swinging/hanging activity required). The right PT will also understand the importance of proprioception in physical therapy. The athlete may get back to lower extremity skills on floor/dance/conditioning at practice even during the time they are seeing the PT before progressing to harder impact skills on their shoulder such as a front hand spring on tumble track as the athlete shows improvement, and then finally a release skill on bars as they near completion of PT. If, on the other hand, the athlete is a swimmer with the same shoulder injury diagnosed- perhaps they will be able to kick with a board while in the water but not do the pulling needed for breast stroke until PT has progressed and the PT is ready to challenge the athlete (and the shoulder injury) with this skill. The exercises in the PT clinic will be different for each sport as will the recommendations for added skills/progression when returning to each athlete’s practice even though the shoulder injury might be similar. Modalities like ice, massage, TENS, stim, laser, ultrasound (and anything that “plugs” you into something) may be a part of your treatment back to sport but none of these are functional. If PT involves all functional exercises OR involves some modalities as well as functional exercises, (things that are similar movements preparing you for the sport you will be returning to) then that is great. If PT involves only modalities then this is likely not adequate to return you to sport. The functional thinking PT will know with special functional testing in the clinic what the next step or skill to add for practice, steadily progressing the athlete back to full sport and decreasing risk for re-injury. In this staged approach, the athlete will see progress every week or two- not only in the PT clinic (with added strength, flexibility, and balance) but also with what they are allowed to do at practice (with added skills and proper technique considering the whole body, the kinetic chain). During this functional testing, the PT may also identify the cause for the injury, perhaps with a dysfunction at the joint above or below the actual injury, evaluating the kinetic chain. Addressing that problem will further decrease risk for re-injury as the athlete progresses back to sport. Staying mentally and physically in shape during recovery is important! Exercises during PT should prepare the athlete for similar activity in practice, during each stage of recovery, until the athlete is discharged from PT and back to full practice with normal function. Using a team of quality specialists that communicate well together and each understanding the injury, the sport, and the individual goals is the best way to get back to sport as quickly and safely as possible.